Back in the 1960 election, it wasn't just Nixon's five o'clock shadow vs. John Kennedy's good looks. There was also a brouhaha created when the candidates' wives had a tiff over clothing. I'm not sure who started it, but Jacqueline Kennedy swore that she didn't spend as much on her clothing as Pat Nixon. She said that Pat shopped at Elizabeth Arden, but Pat said she bought most of her clothes off the rack. Someone accused Mrs. Kennedy of spending $3000 a year on Paris fashions, to which she responded "I couldn't spend that much unless I wore sable underwear." That may be the one and only time Mrs. Kennedy would be heard speaking about unmentionables in publich. Pat Nixon said the politically correct thing about loving American designers, again implying that Mrs Kennedy only shopped the French designers. She did like Givenchy and some of the other French designers, but also wore American designers like Norman Norell (who is from a town not far from where I live). Indeed, her signature look as First Lady was designed by Oleg Cassini who, despite his name, was born a Russian aristocrat but who was naturalized as a US citizen before Jackie commissioned him, and after serving in the Coast Guard in World War II. It doesn't get more American than that. He was the one who came up with her pillbox hats and dress and coat combinations, setting the American fashion world on fire. Mrs Nixon, unfortunately, faded into oblivion fashion-wise, though she did get her turn as First Lady later on. 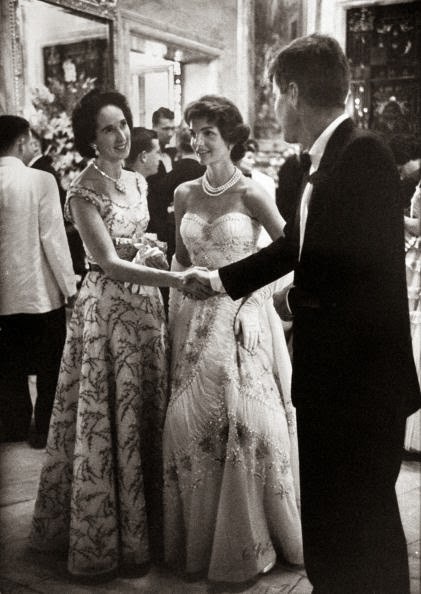 The photo above, attributed to Life Magazine, shows a pregnant Mrs Kennedy at the Tiffany Ball in Newport, in 1957. The designer is not named, but it was unusual to see Mrs Kennedy in something this detailed, as she began to favor simple, classic lines later on. This dress is just lovely, though, with its beading and shirring and, unbelievably, it's not French. It's Italian, by Sorelle Fontana. Of course, this was before her husband became a candidate for the presidency, and before her dispute with Mrs. Nixon began. Fontana, of course is remembered not only for ball gowns made for such beauties as Ava Gardner and Princess Grace of Monaco, but also for making the wedding dress for Audrey Hepburn, before she called the whole thing off. 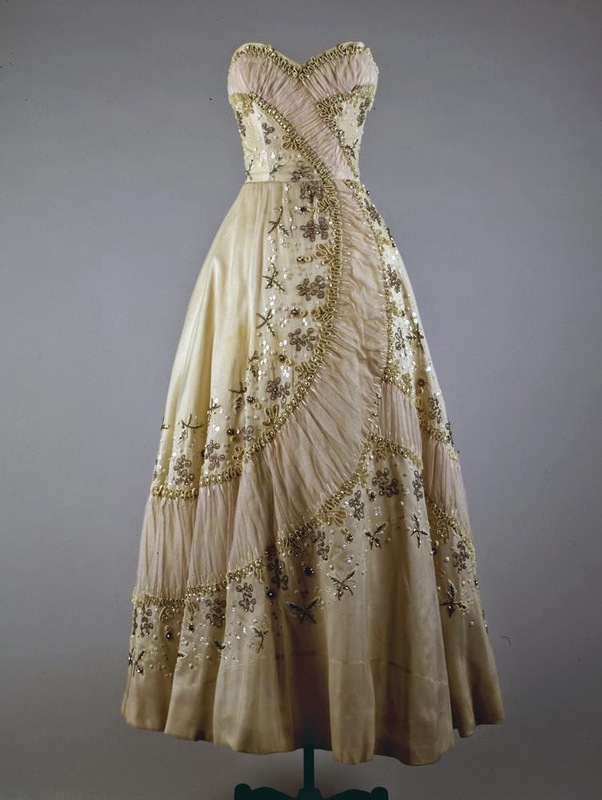 Look at this lovely dress, which is now housed in the John F. Kennedy Library. Looks like I need to make a trip to Boston. Stunning dress! Mrs. Kennedy had the elegance and poise to pull off almost any look! She looks gorgeous in that photo. Interesting article, too. I had never heard of this tiff.